As I mentioned in my previous post, for those just tuning in, I really love the concept of subscription based sample/product boxes. Especially the part about getting something awesome in the mail regularly. 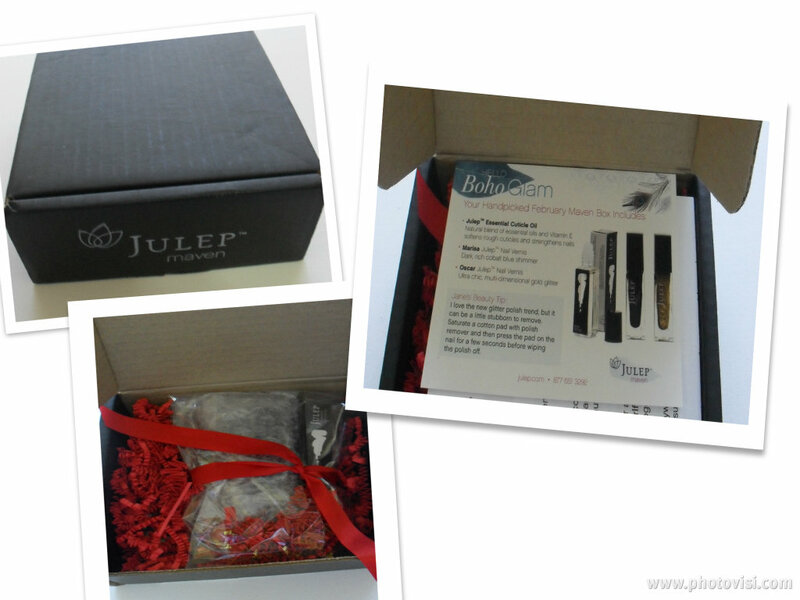 Well today I just received my first box- the Julep Maven box! So this is how the box looked when I opened it (above). This month they included an adorable chocolate “Oscar” (as in the awards show)- which was a very sweet and delicious sort of dark chocolate treat. My style quiz matched me up to a beauty profile that I didn’t really like so I switched it and received the Boho Glam box instead. 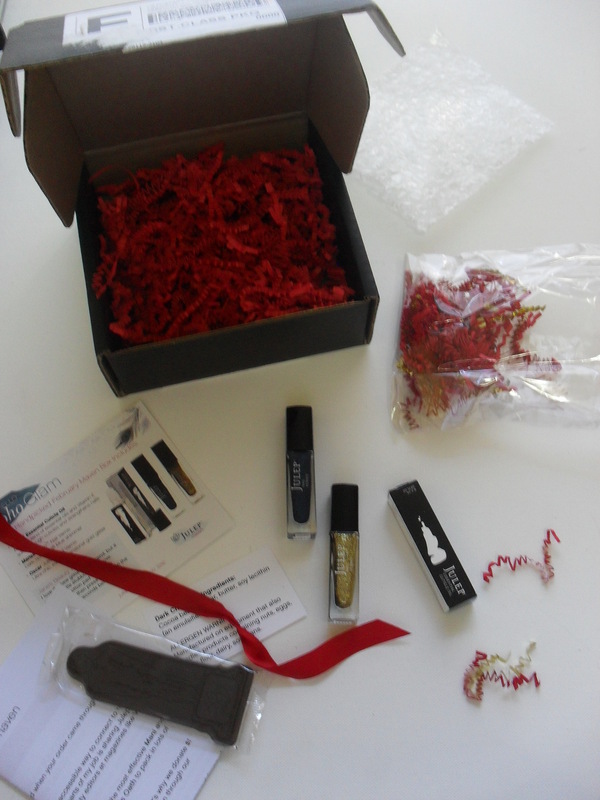 In the box I received one Julep Essential Cuticle Oil (.28 oz), Marisa Julep Nail Vernis (.27 oz), and Oscar Julep Nail Vernis (.27 oz). Both are really gorgeous colors, the Marisa is a deep cobalt blue that has just the slightest bit of shimmer.I just had my nails done so I can’t really show you how it looks painted without ruining my nails- but It’s just a really pretty deep color. The Oscar which is multi-dimensional gold glitter is very glamorous. You can layer it on for a full glittery gold look, or you can put it over another color for an equally impressive style. 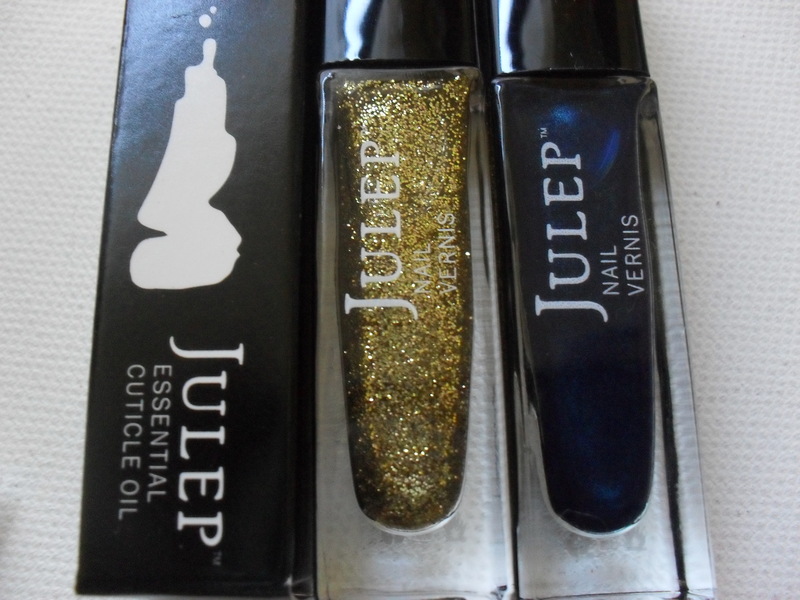 Having tried Julep Maven’s nail polish, I can honestly say that their products are worth their weight in gold. Unlike cheaper (I’m talking about quality, not price) nail polish’s on the market, Julep’s polish’s are true to color even on the first coat. I’ve bought polish that takes five or more coats before I begin to see the color that’s in the bottle, so I’d gladly spend a little more for Julep’s polish which is developed without carcinogens such as formaldehyde or formaldehyde resin, toluene and DBP, and goes on great with the first coat. The Julep Maven Program gives you two full sized polish’s and a full size of their acclaimed Essential Cuticle Oil- retail value $46- all for $19.99 (score yours for a penny by clicking here and entering code COLOR2012 at checkout, for a limited time only). Even if you can’t afford the Julep Maven program regularly- it’s worth it to try it once- your nails will thank you! I love that blue–absolutely gorgeous! I’ve been thinking about trying one of these subscriptions for awhile (who doesn’t love mail). I’m particularly intrigued by quarterly.co’s boxes, where you can pick the person who chooses the box items. Lots of variety. They’re really great- and the blue is ah-maze-ing! You just have to make sure that you don’t subscribe to them all or you’ll find yourself with a $300 charge every month-lol!